The laws on travelling overseas with medication and controlled drugs are complex. Read on to find out if you can take your medicine abroad and how to get a licence for prescription meds. TRAVEL WITH DRUGS: Most countries have strict rules on travelling with medicines. The laws apply to many European countries and almost all of those outside of Europe. The medicine contains a 'controlled drug' such as morphine or diamorphine. You are in possession of the medicines (e.g. tablets or pills) when entering or leaving the United Kingdom. Use caution before attempting to travel with medication outside the United Kingdom. Always check if it is legal to take your prescription medication overseas before putting it in your suitcase. It is smart to plan ahead if you need prescribed medication for a health condition. Discuss your travel plans with your doctor or practice nurse. Try to give them at least two months advance notice before the departure date. Your GP will confirm whether you need to make special arrangements for taking medicines abroad. As a rule, the outcome will mean getting a doctor's letter for overseas travel (e.g. a medical certificate). As part of planning a foreign holiday, will you be taking medication abroad? It is not uncommon to head out of the country for a few weeks between treatments. If so, you should check the rules for all the countries that you will be visiting. That also applies to those that you will be 'passing through' (e.g. in transit). Which particular types of medicine the country allows to cross its border. The maximum quantity of pharmaceutical drugs that anyone can take into the country. As you may already know, you can get many types of medicines and drugs over the counter in Britain. But, other countries may consider the same items as controlled drugs abroad. Because international rules vary, vice versa is also true! Note: Travelling with medication and controlled drugs is illegal in some countries. Doing so can result in a fine or a prison sentence. Before you travel, use the list of foreign embassies in the United Kingdom to find the country you are visiting. In fact, you can take controlled medicines abroad (out of the United Kingdom). But, you must follow some specific requirements. The regulations fall under the 'misuse of drugs' legislation. Anti-anxiety medicines (also known as benzodiazepines). Many of the medicines that contain hormones (e.g. anabolic steroids). Most of the stronger painkillers (e.g. diamorphine). You can check to see what the packaging lists as a drug contained in the medicine. Another method is searching for them on the controlled drugs list. It only lists the common ones controlled under the Misuse of Drugs Act 1971. Thus, you cannot find the names of any particular medicines, only the drugs used in the medicines. Note: The simplest way is to ask your doctor or a pharmacist. They will confirm whether your medicine contains a controlled drug - or not. Be able to prove that it got prescribed for you (e.g. by your doctor). Note: If travelling for 3 months or longer (or carrying a supply that would last at least 3 months). Getting a personal licence will allow you to take controlled drugs abroad. The prescribed medicines must be for you own personal use. That means you can travel with pharmaceutical drugs out of the United Kingdom. It also authorises travelling with tablets and pills back into Britain when you return. But, you must still check the regulations on travelling with medications to other countries. Note: As a rule, you cannot travel with drugs listed in schedule 1. But, you can check with the Home Office Drug and Firearms Licensing Unit before departing. In most cases, you will need to show a letter at the border. The letter should prove your medicine got prescribed for you (and no one else). Which countries you will visit and the dates. A list of your medicinal items (including the quantity, doses, and strength). The signature of the person who prescribed the pharmaceutical drugs for you. Use the 'Personal import/export licence application form' to apply for a personal licence. You will need to list the controlled drug(s) prescribed by a medical practitioner and the name of the person prescribing them. Send the completed application form to the address written on the document. Remember to add the letter that proves your prescription. It can take up to two weeks to get a licence for travelling abroad with medication. It can take even longer if the application comes from outside the United Kingdom. DFLU represents the Home Office Drug and Firearms Licensing Unit. They will help if you need some help to fill in an import/export licence application form. 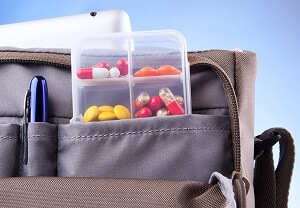 Tourists often pack medications in their luggage as part of a holiday or a journey overseas. But, some 'over the counter' items could land you in serious trouble, or jail, when you get to foreign borders. An increasing number of people are heading to faraway shores nowadays. The Foreign Office advice to all Brits traveling away to foreign lands is to check local laws - before you travel. Many of the offbeat countries have different local laws and requirements. Of most concern to the FCO are some of the 'unexpected' overseas rules on holiday essentials, like medicine and drugs. Almost 50% of the adult population in England are taking prescription medication. Yet, a recent survey suggests only 33% of people will seek advice on taking prescribed medication abroad - before jetting off. It means more than 20 million people need to do more research before taking a holiday in a foreign country. Less than 20% of holidaymakers actually think about checking the rules on non-prescription drugs. Packing a big bunch of legal cold remedies and common cure-alls in a suitcase seems harmless, right? Some countries ban 'over the counter' items, like cough syrups and some allergy medication. Even though we buy these products without much concern in the United Kingdom - Japan bans them (for example). Beware if you are heading off to Costa Rica or China. These countries require visitors to show a doctor's note with their prescribed medication. Most prescription medicines are illegal in Indonesia. Take notice if you were planning on taking sleeping pills or treatments for ADHD. A lot of prescribed drugs contain codeine, Diazepam, or Tramadol. These are 'controlled drugs'. Failing to comply with the laws of the country you visit could result in arrest or a fine. In fact, you would be risking imprisonment in the UAE and Greece. Are you flying out to Costa Rica for a break? If so, do not take any more medication than you will use during the length of your stay. You will also need a doctor's note to confirm you have the correct amount. Qatar considers most over-the-counter medicaments as controlled substances. Jetting off with cold and cough remedies in your hand luggage means you need a prescription. The ever popular Sudafed and handy jar of Vicks rub both contain pseudoephedrine. Japan has decided to ban this sympathomimetic drug. You need a personal licence to travel to Singapore with anti-anxiety pills, sleeping pills, or strong painkillers.